Along with conifer trees and mistletoe, hollies are a botanical hallmark of the winter holiday season in Europe and the United States. Most hollies are dense evergreen shrubs or small trees and produce beautiful red fruits that stay on the plant through the cold winter months. Sprays of the dark green foliage grace festive decorations, and wild and cultivated hollies punctuate spare winter landscapes. Especially popular in winter, too, are warm beverages. 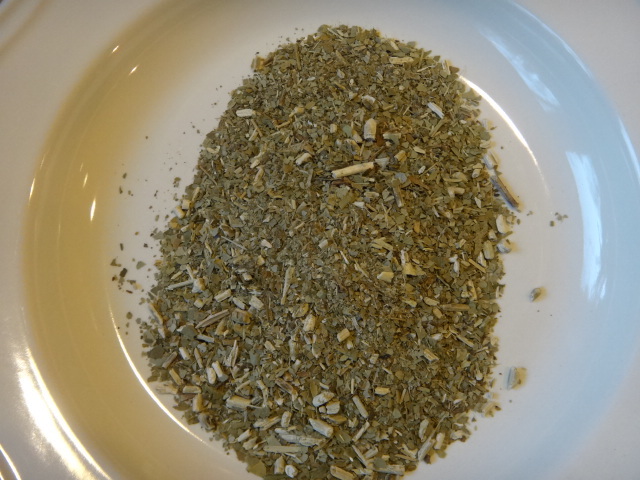 One of the most popular, at least in South America but increasingly elsewhere, is yerba maté. 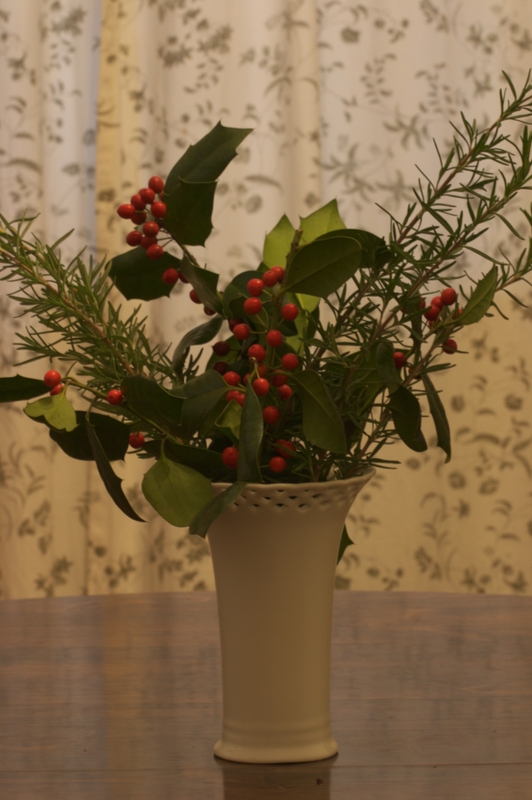 It is a seasonally appropriate choice because the maté plant is a holly. Unlike the decorative hollies, usually American (Ilex opaca) or English (Ilex aquifolium) holly, maté (Ilex paraguariensis) is caffeinated. This puts it in rare company, not only among hollies, but among all plants. Of the 400-600 holly species in the genus Ilex (family Aquifoliaceae; order Aquifoliales), four are known to contain caffeine, humanity’s favorite stimulant: yerba maté, guayusa (I. guayusa), yaupon (I. vomitoria), and té o’ maté (I. tarapotina) (Crown et al. 2012). The genus is cosmopolitan, but the caffeinated species belong exclusively to the Americas. Yerba maté, guayusa, and té o’ maté are native to the Central and South American highlands. Yaupon ranges from the southern United States down into Mexico, making it the only caffeinated plant native to the United States. All of these caffeinated hollies have a long history of human use as beverages (infusions or “teas”). Traditionally maté is consumed in a mug made from a hard gourd shell. Boiling water is poured over a small amount of the shredded dried (and often lightly smoked) leaves in the bottom of the gourd. The infusion is drunk through a special straw, called a bombilla, with a filter on the bottom of it. Many non-caffeinated holly species throughout North American, Europe and Asia historically have also been—and in some places still are—employed in pleasant or medicinal beverages. Green Deane has great tips for preparing your own infusions from edible hollies. The four caffeine-containing hollies also boast appreciable levels of theobromine and/or theophylline, two other xanthines (purine alkaloids) that are chemically similar to caffeine and also affect mammalian physiology. 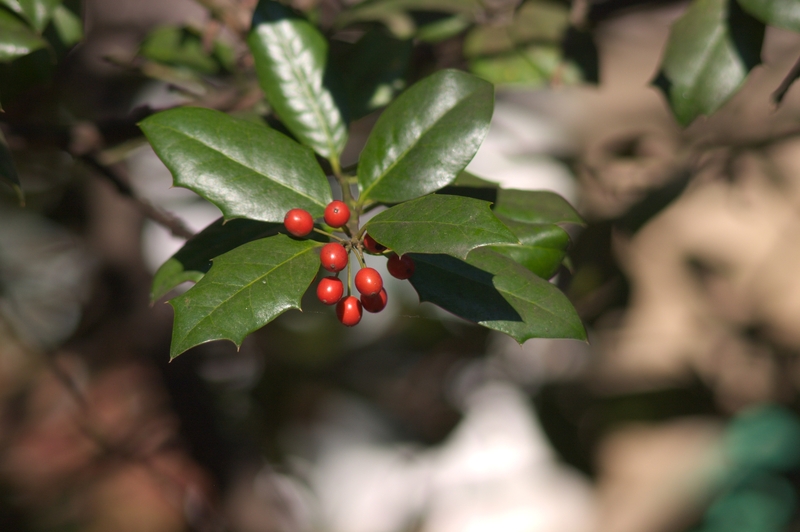 Although only a small fraction of the hundreds of holly species have been tested for xanthines, most of the species that have been tested completely lack xanthines. 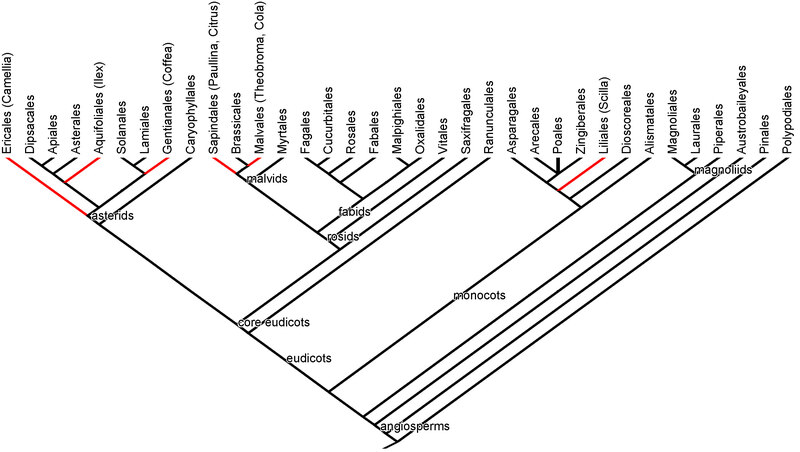 Xanthine content is shown on the Ilex phylogeny below, containing species for which xanthines have been measured and for which there was also phylogenetic placement within the sprawling genus. Guayusa and té o’ maté have not been phylogenetically placed within Ilex, but the other two caffeinated hollies, yaupon and yerba maté, cluster together on the phylogeny as sister species. Theobromine especially, and theophylline less so, are widely distributed throughout the genus. 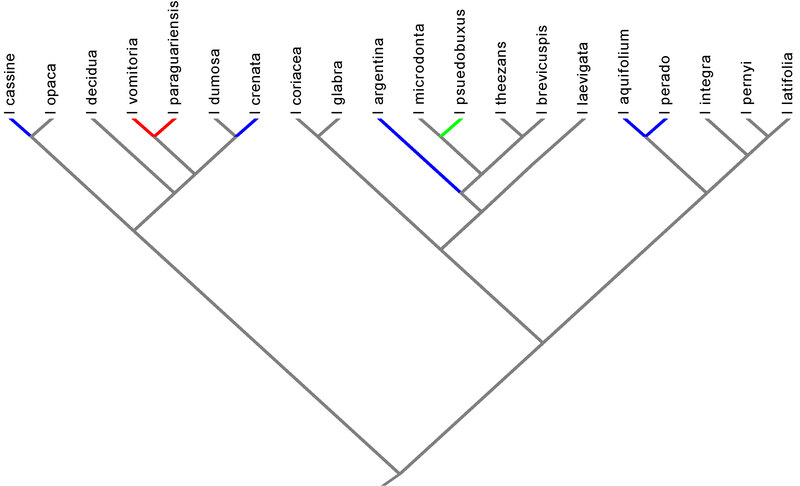 Phylogenetic relationships among Ilex species for which both xanthine and phylogeny data exist. Red branches indicate caffeine; blue branches indicate theobromine; green branches indicate theophylline. Click to enlarge. Ilex phylogeny data from Manen et al. (2010). Ilex chemistry from Alikaridis (1987), Ashihara and Crozier (1999, 2001), Filip et al. (1998), Reginatto et al. (1999), Hao et al. (2013), and Crown et al. (2012). When caffeine is detected in any plant, theobromine and/or theophylline (and some other minor xanthines) are often also present. Coffee (Coffea sp. ; Rubiaceae; Gentianales) has theobromine as well as caffeine, and tea (Camellia sinensis; Theaceae; Ericales) and kola nut (original flavor and caffeine source for cola sodas; Cola nitida; Malvaceae; Malvales) have all three xanthines, as does guarana (Paullinia cupana; Sapindaceae; Sapindales), a caffeine-containing plant that is popular in the tropics and gaining a following elsewhere. Theobromine is famous as chocolate’s (Theobroma cacao; Malvaceae; Malvales) primary drug, but chocolate also contains caffeine and theophylline. Theobromine and theophylline have been detected in a few more Ilex species beyond the caffeine-containing four (see Alikaridis 1987, Filip et al. 1998). This pattern holds for Coffea (Silvarolla et al. 2004) and Camellia (Ishida et al. 2009) species as well, which may be because theobromine is an intermediate step in the caffeine production metabolic pathway (Ashihara and Suzuki 2004, Ashihara and Crozier 1999, 2001). If the last enzyme in the process is somehow disrupted, either by natural genetic mutation or genetic engineering, theobromine can accumulate. In total, Ashihara and Crozier (1999, 2001) report that around 100 plant species have confirmed caffeine content. Annoyingly, though, I couldn’t find a comprehensive list of caffeinated plants, even by following the trail of literature cited by otherwise highly competent people reporting these 100 caffeinated species from “13 orders” (e.g. Ashihara and Suzuki 2004). Turns out most of those “13 orders” (Ashihara and Crozier 1999) are obsolete names from a 1950s-era taxonomic scheme, so without an actual list of species, it will be impossible to know the modern phylogenetic pattern of caffeine. This seems to be a gross oversight in the known biology of such an economically important compound. Ashihara and Crozier (1999, 2001) and Ashihara and Suzuki (2004) do helpfully note that all caffeinated plants are eudicots except Scilla maritima, a monocot. They also mention that caffeine has recently been discovered in the flowers and pollen (but not other structures) of several citrus-family (Rutaceae; Sapindales) species. Caffeine is also manufactured by at least one fungus, Claviceps sorhicola, an ergot-type pathogen of sorghum (Ashihara and Crozier 2001). Also annoying is rampant disagreement among published studies about whether or not some Ilex species have caffeine or other xanthines. This disagreement is only over very low levels of the stuff, though, so I’ve erred on the side of “no caffeine present” for controversial cases here. So, wherever it may be, the list of caffeine-containing species is clearly a work in progress. The popular caffeine-containing plants, though, come from five different orders on the plant phylogeny (see phylogeny below; go to our Food Plant Tree of Life for a brief phylogenetics refresher). The picture of the phylogenetic distribution of caffeine in our food plant orders, as far as I can determine it, suggests caffeine production arose by convergent evolution, in which the same character evolves multiple times independently in different lineages (like lemon flavor). Three of the five orders containing most caffeinated plants, however, are from the large asterid clade, and Sapindales and Malvales are fairly closely related orders within the malvids. This suggests that the genetic environment in which caffeine synthesis could evolve is fairly old and somewhat conserved through evolutionary history. While purine nucleotides provide the raw material for caffeine production in all these plants, different plant lineages use unique metabolic pathways to synthesize the stuff (Ashihara and Crozier 1999, 2001, Ahihara and Suzuki 2004). Phylogeny of orders with edibles. Caffeinated branches in red, with the caffeinated genera labeled. Click to enlarge. Xanthines are only one class of the hugely diverse group of alkaloids widely present in plants all over the phylogeny. Most plant species don’t produce alkaloids, but alkaloids are widespread and often have spectacular pharmacological properties (see our nightshade post for a few and Amy Stewart’s Wicked Plants for a rundown of the most notorious). Like so many other phytochemicals that humans find flavorful, fun, medically beneficial or poisonous, plants use alkaloids to defend themselves against herbivores and pathogens. Xanthines may also be allellopathic, as they are retained in large quantities in seed coats and abscised leaves that fall to the ground, whereupon the xanthines are released to the soil and may inhibit seed germination of other species (Ashihara and Crozier 1999). Alkaloids are rich in nitrogen, which is an element often in short supply to plants and limits plant growth. Nitrogen fertilization of yaupon has been shown to dramatically increase its caffeine content (Palumbo et al. 2007). Soil fertility likely contributes to the dramatic differences in xanthine content of yerba maté plants grown in different plantations (Marx et al. 2003). Humans the world over must have cautiously respected the physiological effects and addictiveness of caffeine from their earliest experiences with it, as the long history of human consumption of all caffeinated plants always begins with judiciously incorporating the plants into religious ritual or reserving their use for royalty (Fredholm 2011, Jamieson 2001). Later caffeinated plants were used primarily for medicine, or regarded simply as delicious (and variously otherwise beneficial or harmful). Males from tribes indigenous to the southern United States historically used a very strong brew of yaupon to induce vomiting to supposedly induce purity and clarity in advance of religious rites or important meetings, which is why the plant’s Latin name is I. vomitoria (Crown et al. 2012). Modern fans of the plant find a dilute infusion of yaupon quite pleasant and rightly tout it as a local caffeinated beverage (Palumbo et al. 2009), but that history and Latin name inspire me to tip my hat to a company marketing the stuff. Given that warm teas from various species, coffees, and chocolate are important parts of modern holiday celebrations, it feels appropriate during this time to remember the role of the caffeinated plants in rituals throughout history. Whether you mark the season with reflection, spending time with people you love, religious devotion, or slinging your pumpkin spice latte around town in a mad shopping rush, we wish you a warm and happy end of the year. Alikaridis, F. 1987. Natural constituents of Ilex species. Journal of Ethnopharmacology 20: 121-144. Ashihara, H., and A. Crozier. 1999. Biosynthesis and metabolism of caffeine and related purine alkaloids in plants. Advances in Botanical Research 30: 118-205. Ashihara, H., and A. Crozier. 2001. Caffeine: a well known but little mentioned compound in plant science. Trends in Plant Science 6: 407-413. Ashihara, H., and T. Suzuki. 2004. Distribution and biosynthesis of caffeine in plants. Frontiers in Bioscience 9: 1864-1876. Crown, P. L., T. E. Emerson, J. Gu, W. J. Hurst, T. R. Pauketat, and T. Ward. 2012. Ritual Black Drink consumption at Cahokia. PNAS 109: 13944-13949. Filip, R., P. Lopez, J. Coussio, and G. Ferraro. 1998. Mate substitutes or adulterants: study of xanthine content. Phyototherapy Research 12: 129-131. Fredholm, B. B. 2011. Notes on the History of Caffeine Use. Methylxanthines. Edited by B. B. Fredholm. Springer. Pages. 1-10. Hao, D., X. Gu, P. Xiao, Z. Liang, L. Xu, Y. Peng. 2013. Research progress in the phytochemistry and biology of Ilex pharmaceutical resources. Acta Pharmaeutica Sinica B 3: 8-19. Ishida, M., N. Kitao, K. Mizuno, N. Tanikawa, M. Kato. 2009. Occurrence of tehobromine synthase genes in purine alkaloid-free species of Camellia plants. Planta 229: 559-568. Jamieson, R. W. 2001. The essence of commodification: caffeine dependencies in the early modern world. Journal of Social History. Winter: 269-294. Manen, J.-F., G. Barriera, P.-A. Loizeau, and Y. Naciri. 2010. The history of extant Ilex species (Aquifoliaceae): Evidence of hybridization within a Miocene radiation. Molecular Phylogenetics and Evolution 57: 961-977. Marx, F., M. J. J. Janssens, P. Urfer, and R. Scherer. 2003. Caffeine and theobromine composition of mate (Ilex paraguariensis) leaves in five plantations of Misiones, Argentina. Plant Foods for Human Nutrition 58: 1-8. Palumbo, M. J., F. E. Putz, and S. T. Talcott. 2007. Nitrogen fertilizer and gender effects on the secondary metabolism of yaupon, a caffeine-containing North American holly. Oecologia 15: 1-9. Palumbo, M. J., S. T. Talcott, and F. E. Putz. 2009. Ilex vomitoria Ait. (yaupon): a native North American source of a caffeinated and antioxidant-rich tea. Economic Botany 63: 130-137. Reginatto, F. H., M. L. Athayde, G. Gosmann, and E. P. Schenkel. 1999. 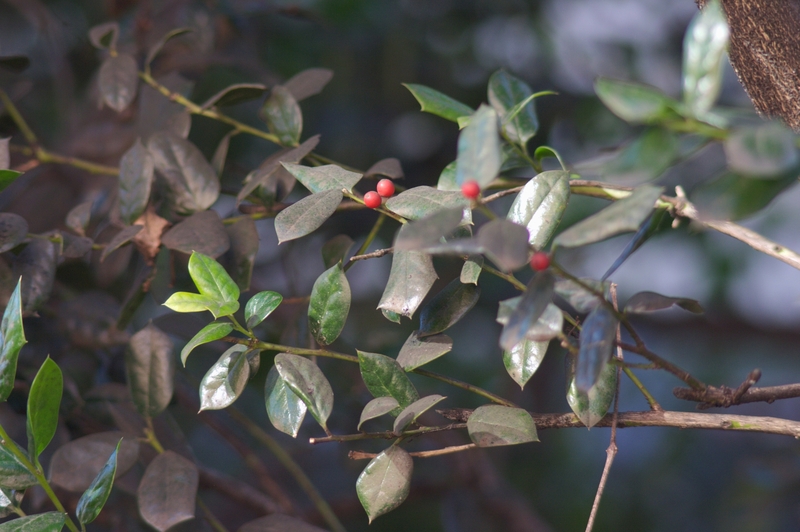 Methylxanthines accumulation in Ilex species—caffeine and theobromine in Erva-Mate (Ilex paraguariensis) and other Ilex species. Journal of the Brazillian Chemical Society 10: 443-446. Silvarolla, M. B., P. Mazzafera, and L. C. Fazuoli. 2004. A naturally decaffeinated Arabica coffe. Nature 429: 826. This entry was posted in Uncategorized and tagged alkaloid, caffeine, chocolate, Citrus, coffee, defense, guarana, holly, Ilex, Jeanne L. D. Osnas, phylogeny, tea, theobromine, theophylline, xanthine, yerba maté. Bookmark the permalink. Thanks so much, Stephanie. I don’t know anything about wild citrus dispersal. If you find something interesting out, let us know. Excellent Christmas post, thank you. Very interesting. Must go get myself some yerba mate to try. As you pointed out, I would have thought more would have been researched about caffinated plants. As a caffeinehead I’d love to know the relative amounts of caffeine in the different species on your phylogeny diagram. So would I! I shied away from any such designation in this post because there is a lot of within-species variation in caffeine content, partially driven by genetics, partially by growing conditions. Caffeine content also varies by plant part, age of said plant part, and post-harvest processing. That’s why caffeine content varies among white/silver, green, oolong, black and puerh tea, even though all those varieties come from Camellia sinensis. Great stuff. Another caffeinated plant of interest is Yoco (Paullinia yoco) from the upper Amazon. I tried the brew made from the bark of yoco in Ecuador and found it to be a pleasant, clean, and very strong caffeine high. I only drank about half of what was offered to me and it was probably the strongest caffeine intoxication I have ever experienced. Wade Davis describes it well in One River and claims the amount consumed daily by regular drinkers is equivalent to about 20 cups of coffee. Thanks for sharing your experience, Chid. There’s quite a bit of literature about caffeine levels in various Camellia and Coffea species (as well as Ilex), but I didn’t see reports of interspecific variation in Paullina caffeine content. But I also didn’t look for it specifically.So this is very cool to know! Great article, by the way….Thanks!